Deadpool 2 is an upcoming American superhero film based on the Marvel Comics character Deadpool, distributed by 20th Century Fox. It is intended to be the eleventh installment in the X-Men film series, and a sequel to the 2016 film Deadpool. 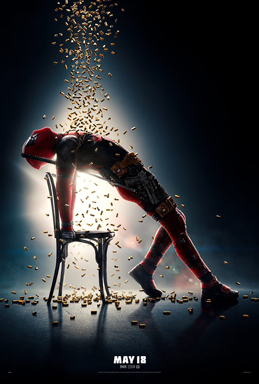 The film is directed by David Leitch from a script by Rhett Reese, Paul Wernick, and Ryan Reynolds, with Reynolds starring in the title role alongside Josh Brolin, Morena Baccarin, Julian Dennison, Zazie Beetz, T.J. Miller, Brianna Hildebrand, Jack Kesy, and Stefan Kapičić. In Deadpool 2, Deadpool forms the team X-Force to protect a young mutant from Cable. Deadpool 2 is scheduled to be released in the United States on May 18, 2018. A sequel, Deadpool 3, is in development.